I have posted previously about a simple terrain heightmap display program I have made, but never talked about some of the methods of generating and manipulating heightmap based terrain systems. The method I have implemented in my terrain generation program is known as the Diamond-Square algorithm and is a method of procedural terrain generation. The Diamond-Square algorithm is also known as random midpoint displacement fractal, cloud fractal or the plasma fractal. We start with a 2D array of size (n^2 + 1) E.g. 257, 513 etc. Set the four corners to initial values, these can be random or preset it doesn’t really matter too much at this point. We then perform the diamond step which consists of taking the four points arranged in a square shape, averaging the four values and adding a random value to the average, creating diamond shapes. The square step then averages the four corners of the diamonds created in the previous step. The center value of this step becomes the corners of the next step. The diamond and square step are repeated until all the points in the grid have values assigned to them. step for each square present. step for each diamond present. Reduce the random number range. 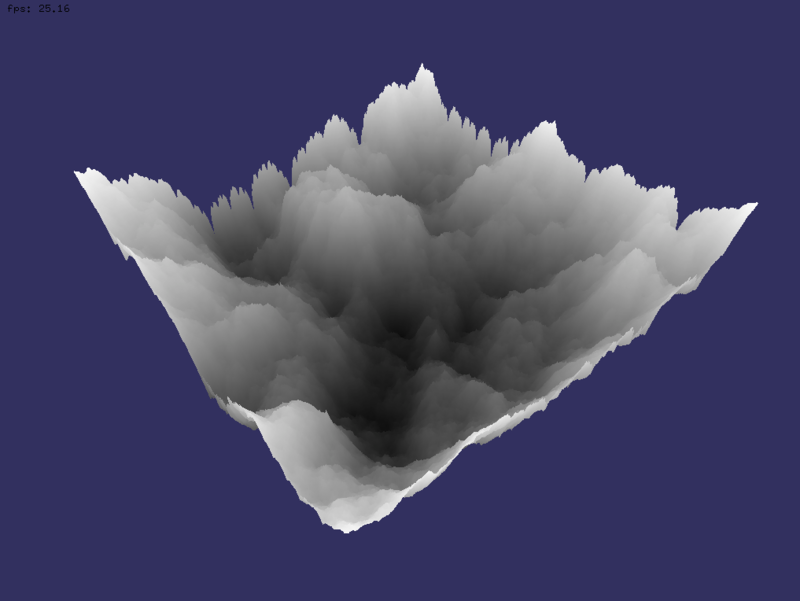 Then we end up with a program that can generate terrain / cloud maps / general fractal noise. 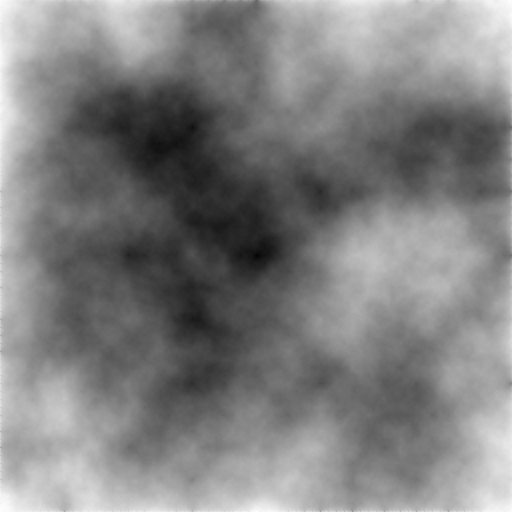 Below is an example image that I have generated at 512×512. Other features that I think need to be added to this code is the ability to generate textures as well based on the height values, smoothing of the terrain and improvements to the viewer. For now though, here is some source code. This code saves the height values to a file. I haven’t included any image saving functionality in this version because I am not sure of the licensing issues that may arise. Will find out soon, more updates to this coming in the next couple of days. This entry was posted in Games Development. Bookmark the permalink. Thanks for linking to my SO question! I really like your site. Excellent content. Please continue posting. the implementation is prettty intersting could u plz tell me how do u run this code….? Just download the source and compile it with visual studio or gcc, or something similar, it’s standard c++ code. You need to create a terrain loader that works with that file structure. There is an example here https://danielbeard.wordpress.com/2010/08/11/opengl-openframeworks-terrain-loader-update/ , but you will need to download openFrameworks as well. I enjoy reading your Games Programming Blog, and would like to respectfully ask a question. I was wondering if you had ever done any research on buying mathematical algorithms vs. programming them yourself? Especially for complicated mathematical subroutines, is it cost effective to subscribe to an algorithm library (like http://www.nag.com) for about $3000 per year, or let your programmers do all the work? I’d appreciate any informed opinions on this subject, or personal experiences.